Sorry Sir Ian I beg to differ! The best scrambled eggs in the world are in fact made by me! Let me tell you I come from a long line of culinary geniuses. My mother and grandmother were two ordinary Lancashire lasses who made some of the best home made food ever known to mankind. They could bake bread and cakes as well as serve up a dish from simple ingredients that was fit for a king. My mouth salivates now thinking of their Lancashire hotpots. My brother inherited the cooking genes. He was Executive Chef at the Royal Bank of Canada in Toronto. He once prepared the grandest menu and cooked for the modern day equivalents of kings. It was a G7 Summit held in Toronto and attended by the likes of the then Prime Minister, Margaret Thatcher and then President of the United States, Ronald Reagan. These dignitaries were no doubt surrounded by ‘scrambled eggs’ of a different kind. Peter, my brother, had a hand in teaching me a thing or two about scrambled eggs and how to make them properly. First off, I always used to add milk to my mix. “No” he said, “Just use water”. He never explained why, but he was right. They just taste better. The seasoning has to be just right. At this early stage all you need is salt, preferably sea salt, and white pepper. Yes, white not black pepper. Give it all a good whirl and mix thoroughly with your fork. Now comes the real action! This is how you make your scrambled eggs stand out from the crowd! Extra ingredients! Depending on your tastes, simply add grated cheese and chopped up shallots. Mix thoroughly. And whether you cook the scrambled egg mix in a bowl in the microwave or use the more traditional method of the stove top pan or skillet, you will end up with the most tasty scrambled eggs you ever had! If spice is your thing then simply thinly slice some cooked chorizo sausage into your mix with some green or red chilies, seeds as well, again mix thoroughly and when cooked you will never ever have to add Tabasco sauce to scrambled eggs again! Never ever over cook scrambled eggs. If they are rubbery then throw the dish away! 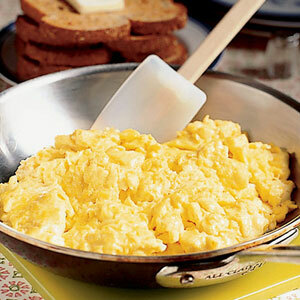 Scrambled eggs are meant to be eaten when they are light, fluffy and extremely soft but not runny. This is why my scrambled eggs are the best in the world. Sorry Sir Ian I did not even watch your video as there seemed no point. I know mine are better than yours. They must be. As I say – they are the best in the world!